As much as I love how Elsie is now interacting with us and enjoying her play time, man is she hard to keep entertained. She has the attention span of a gnat and we find ourselves having to reach for different toys and distractions all the time, especially as she’s now trying to get her paws on our phones, laptops and remotes. Great. 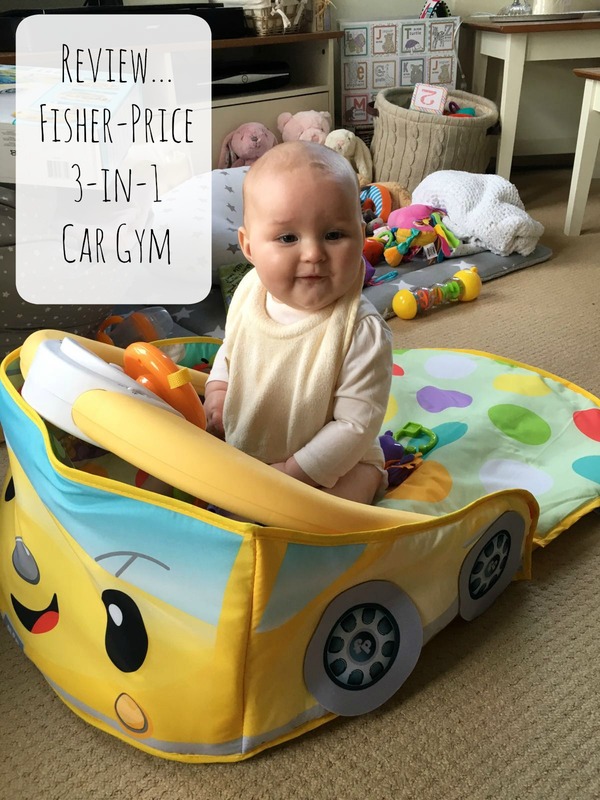 This mummy performing monkey is always on the lookout for new ways to keep her entertained, so when we were asked to review the Fisher-Price 3-in-1 convertible car gym I was thrilled. I’ll try anything that will let me make a cup of tea or put a wash on without being screamed at for five minutes. The Fisher-Price Car Gym is a 3-in-1 activity centre that allows baby to play and explore laying, sitting and being on their tummies. It can be used from newborn through to toddler, adjusting as baby grows. It boasts an array of bright and fun activities set out to help develop baby’s senses through the use of lights, music, and removable toys, all combined into a very groovy convertible car. Beep beep! Tummy Time. The play bar can be lowered flat, providing a distraction whilst strengthening their skills on their tummies. Sit & Drive. Adjusted to create baby’s very own car dashboard that include a steering wheel and fun car sounds. She loves it. The first time we sat her at the steering wheel her face lit up. She loves whacking the steering wheel and hearing the ‘broooom brooom’ sounds. All the detachable toys are cool too; her favourites are the soft dice and car keys which of course go straight into her dribbly mouth. We are still working on our tummy time issues, but Elsie is kept engrossed in the laying and sitting positions so that’s good enough for me. It’s bright. The colours, shapes and characters all over the car catch her eye line and it’s fascinating to see her focus on a new aspect of the gym. It keeps her entertained and if baby loves it, mummy loves it. It’s versatile. I really appreciate the range of positions you can sit baby in to explore the gym; baby can sit, lay or experience tummy time depending on their (or mummy’s preference) I know I can lay her on her back safely whilst I rush off like road runner to do a mummy chore, or then come back and move her to sitting whilst I play or work next to her. It’s stimulating. The car is bursting with colour, textures and noise that keep her fascinated for some time, and in Mummy world,that’s priceless. It’s amusing. 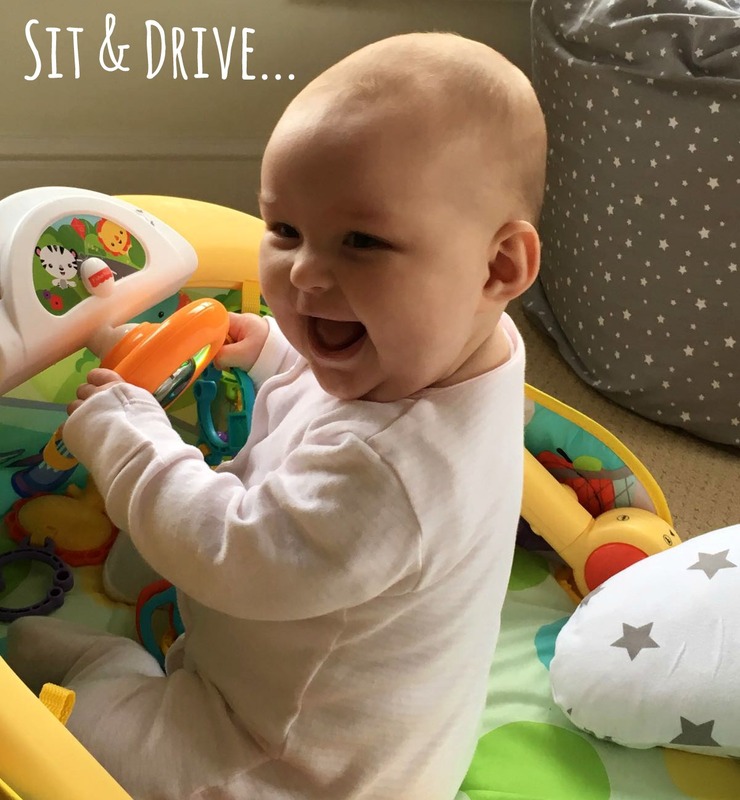 I love seeing Elsie sitting at the steering wheel tapping on the beep; it makes us all chuckle watching her pretend cruise around our front room. I dread the day she actually goes out driving in her own car one day, but for now I’m happy to watch her beep beep in her fun little convertible. Doubt she’ll be so taken with it when she turns 18, although I’ll definitely give it a go. It folds relatively flat. Depending on how big your home space is, storage is always important when it comes to babies toys and the 3-in-1 car gym can be folded quite well to store away at the end of each day. We’ve been storing ours either under the dining room table or down the side of the sofa for easy access. It’s also really light if you wanted to take it with you when travelling away from home. The only downside to the gym is that I find it a little tricky to adjust the bar. You almost need a third hand to push it in the desired direction whilst you’re other two hands pressed the buttons on either side to release the bar, but there’s a good chance this is just me being fickle. Also the gym doesn’t come with batteries so you’ll need to have these handy to enjoy all the fun car sounds. 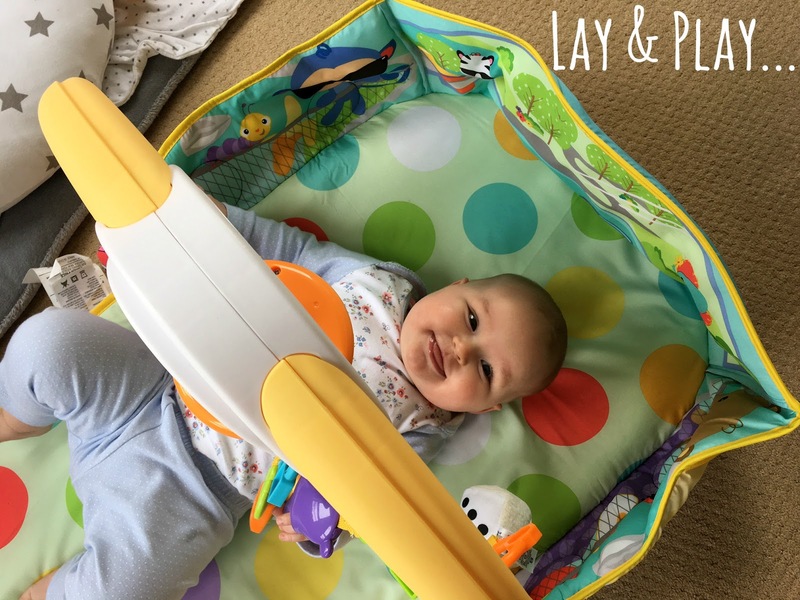 We use the car baby gym most days and I would definitely recommend it to my friends, which is currently on sale for £44.99. 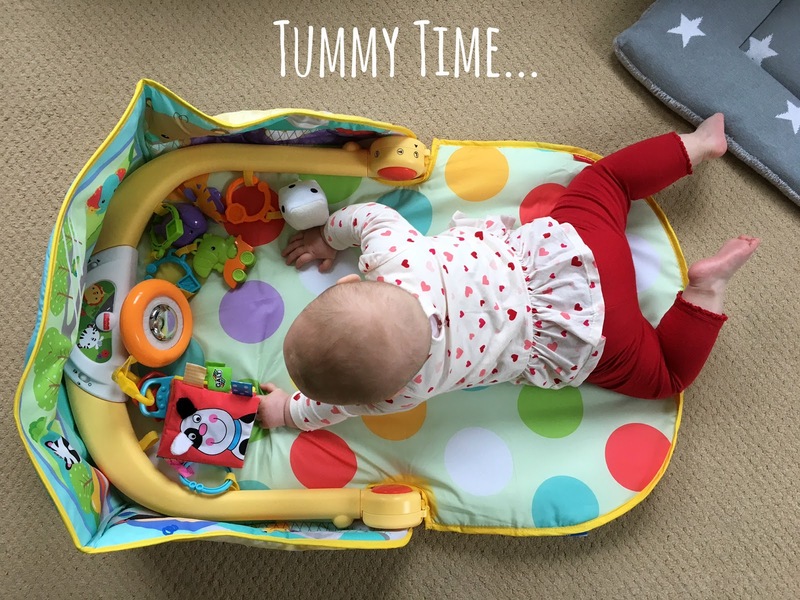 It’s amazing how quickly babies attention spans change and you constantly find yourself having to grab something new to entertain them throughout the day, so it’s great having a play station that can be adjusted to allow your baby to explore in a new way. With Love & Beep Beep!